Are you one of those who use the plantpots to decorate your Minecraft worlds? Don’t you think they are boring? Painter’s Flower Pot 1.6.2 is a mod that increases the variety of lantpots, now we can make plantpots of different colors and design to plant in a colorful environment. With this mod you will be able to plant in plantpots things that you couldn’t before. To make that you should place soil inside of the plantpot and then put the plant. Except for cactus that should be placed on the sand not on the soil. Although as we said at the beginning, the main focus of this mod are the plantpots. Now we can create pots for plants using many more materials or useing dyes to change their color, in addition to plant in them a great variety of decorative elements. 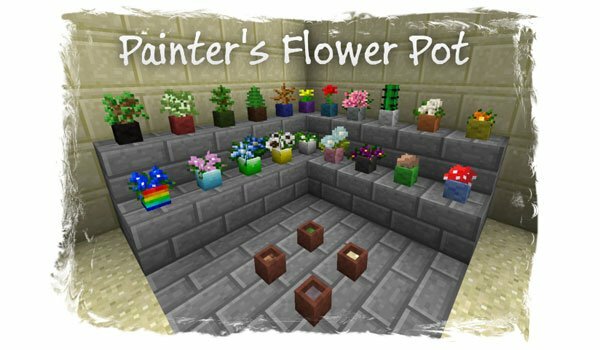 How to install Painter’s Flower Pot Mod for Minecraft 1.6.2? ¡Start deco gardening in your Minecraft!